Home » Belt with biophotons "Huashen"
L = 82 ~ 92 cm. XL = 88 ~ 98 cm. 2XL = 93 ~ 105 cm. 3XL = 100 ~ 110 cm. 4XL = 106 ~ 117 cm. 5XL = 130 ~ 147 cm. Note: belts are stretching well. 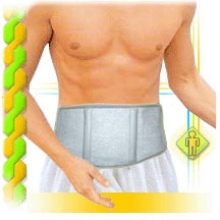 The belt is the most convenient and versatile product. When you use the <<Belt with bio photons>> not only are the pain and inflammation go awa, but also, importantly, the immunity of the organism improves, and the function of the phagocytes of leucocytes and floor cells also improve. The pains, caused by: pinching of the nerves, functional impairments of the vegetative nervous system and offset inter vertebral discs is disappearing effectively. * Pain caused by functional disturbances of the autonomic/vegetative nervous system: abdominal pain, bloating. Offset of the inter-vertebral discs is one of the causes of back pain in the legs. When severe pain in the lumbar region it can spread at your feet, sometimes going numb, one of the lower limbs, sometimes – the two extremities are most common among 40-60 year old men. Inter-vertebral disc is an elastic body with its high content of water located between the breast or back vertebrae. Spinal discs not only provide the flexibility of the spine, but also the physical activity to amortize the spine. Diseases of the stomach. Often there is talking about diseases of the stomach, mainly meaning gastritis, ulcers of the stomach and duodenal ulcers. Among the factors, which are influencing the emergence of these diseases: there is heredity, environmental pollution, poor nutrition, and use of a lot of alcohol. These diseases are starting to develop by the pain in the stomach, nausea, vomiting, diarrhea, digestive problems etc. By wearing the belt: the immunity becomes stronger, injured cells are restored, and there is bactericidal effect. Kidney – is the principal organ of the urinary system, which plays an important role in maintaining a constant balance within the body. Right and left kidney which are located on both sides of the spine, adjoin the rear waist, right kidney is situated a little below the left kidney. Kidney blood vessels siphon off large amounts of blood; they form a network of capillaries that are nutrients. The most commonly spread disease of the kidneys. Osteochondrosis- is a disease that has afflicted humans, made them suffer and has also raised a number of diseases of other organs and systems in the body; it is the most advanced form of degenerative-dystrophic destruction. It is based on progressive devastation of spinal disk degeneration – – involving the related bodies of the vertebrae, inter-vertebral joints and vertebral body wrapping. Bio photons - improve the processes of the microcirculation, promote restoration of venous outflow, hinder the development of tissue edema, stimulate the work of the ligamentous and muscular spine and joints, promotes regeneration, eliminate pain and inflammation, contribute to the resorption of adhesions (adhesions was repeated exacerbations contribute to sciatica after colds and hypothermia) .